My daughter and a few of her friends went out to the Enmore Theatre to watch a show one night. As they are early teens, us mum's decided while they were at the show we would have dinner together. We ended up at Webster's Bar at King St, Newtown. It was one of those nights where I didn't feel like a steak or even a big meal, so I decided on the chef's salad. I am so glad I did, it was delicious, the flavour combination was just divine, every bite was delicious. 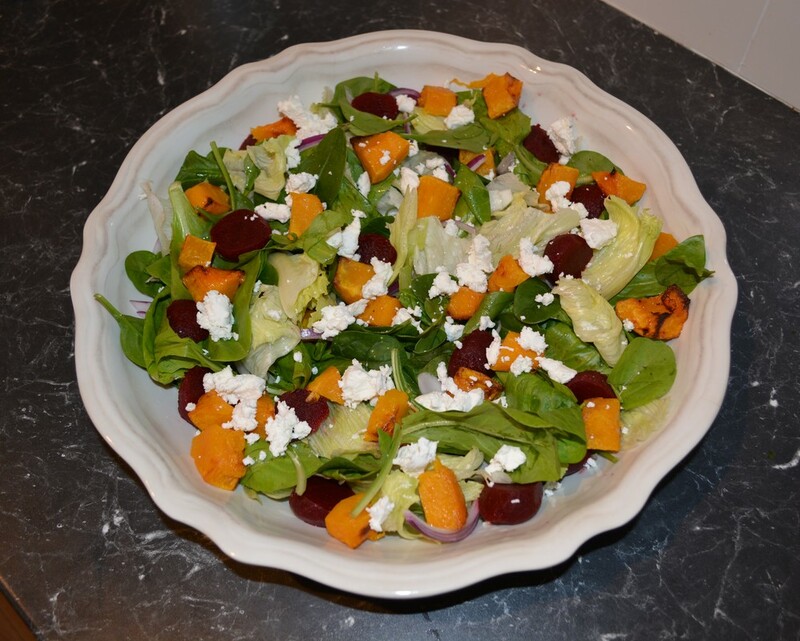 It had sweetness from the pumpkin, sourness from vinaigrette, the goats cheese, a lovely addition, it was the perfect salad. It was so good I had to try and make it home. So from this I have come up with this recipe. This to me can be added as a side to a barbecue or it is a meal in itself. And anyone that has never put roasted pumpkin in a salad before, you need to try it, it is just so good. This recipe is a guide it can be doubled, it can be halved, you can make it for one person, you can make it for 20 people. You can add more of one ingredient, less of another, this is really up to you. Roast or boil the beetroots, how you prepare them is up to you. You can even use baby beetroots from a jar, it works just fine. If you are roasting the beetroots, cover each one with aluminium foil and bake with the pumpkin for 45-60min or until when pierced with a skewer, the skewer slides into the centre easily. If boiling place in a pot with cold water, bring to the boil, cook for about 30 minutes or until when pierced with a skewer, the skewer slides into the centre easily. I got the vinaigrette recipe from the food network and I am keeping the recipe in the quantities as it was posted there. If you don't use it all, as it makes over 1 cup of salad dressing, it will keep in the refrigerator for a few days. So either reduce the amounts if you like, if you are making a small salad, or make it like I did and refrigerate any leftovers. Also of by chance you run out of honey, as I did once, you can sweeten it with sugar. You can also serve the salad undressed, with the dressing on the side in case someone doesn't like dressing on their salad. There is a lot of versions of a Chef's Salad, this is mine. Simple and packed full of flavour. Just remember the recipe is a guide, add more or less of what you like, and with the dressing, this makes a lot, but it keeps well for another day. Place the cut up pumpkin on a baking paper covered baking tray, season with a little salt and pepper and drizzle with a little olive oil. Bake for 30-40 minutes or until when pierced with a fork, the fork slides into the centre easily. If you are roasting the beetroot, (wrap each on individually in foil) and place on the same baking tray and bake for about 40-60 minutes or until when pierced with a skewer, the skewer slides into the centre easily. Allow to cool slightly, it can even be added to the salad cold. Make the vinaigrette: Rub the sides of a bowl with the cut side of the garlic, then discard garlic. In the bowl whisk together the mustard, honey and vinegar. While whisking, slowly add the olive oil. Season with salt and pepper. Place the salad leaves in a large bowl, add the onion, give it a little toss to spread the onion around evenly. Now place on the tomatoes, beetroot and pumpkin. Sprinkle over the crumbled goats cheese. Drizzle over the dressing, just enough, don't over dress. You can always add a little extra dressing on the side if someone likes more.